We may not see flying tigers, thunder dragons or even a kingdom in the clouds but our imaginations will be full of these exotic figures when we travel to Bhutan. Bhutan is a land of myths and legends that are alive today in preserved culture and maintained traditions. Magical, colourful and unique, trekking in the kingdom of Bhutan is perhaps the ultimate Himalayan adventure. 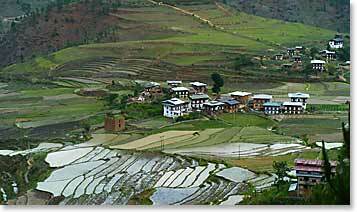 Please stay tuned as our group treks through the remote high lands of Bhutan. May 26, 2008 – Learning about their religion, their culture and best of all, the people of Bhutan!